Crown prosecutor Derek Weaver calls Michelle Lefrancois to the witness stand. In 2011 she worked as financial adviser associate at CIBC uptown, at King and Germain streets. Dennis Oland murder trial day #26 . Crown prosecutors begin moving into Dennis Oland’s deteriorating financial situation in the months, weeks and days before the murder. First witness is CIBC banking representative Michelle Lefrancois. She did some banking for both Dennis and Richard Oland. Dennis Oland was also a client. On Aug. 9, 2010, she handled a $75K secured line of credit application for him. It was secured against his home at 58 Gondola Point Rd. in Rothesay, application displayed on monitor in courtroom shows. Dennis had an unsecured line of credit with the bank but 11 months before the murder he applied for a $75 ,000 secured line of credit against his Rothesay home. “It is like a mortgage,” she says. A lien is placed against the property so CIBC can force collection of an outstanding balance if Oland were to default on payments. On paper it appeared Dennis owned the home free and clear. The bank didn’t realize Dennis had already borrowed against it from his father. Seven months after the $75 ,000 line of credit against the house is approved / and four months before the murder Dennis Oland applies to borrow more against the property on March 8,2011. The family homestead was valued at approximately $650K at the time, Oland's first trial in 2015 heard. The increase is for another $88 ,000 for a total loan against the property of $163 ,000. This new amount was reflected in a new larger bank lien on the house. Lefrancois has just confirmed the home was appraised at "ballpark $650K ." Just 7 months later, Oland increased his line of credit to $163K , court hears. A few months later, in June or July of 2011, he had a 'bounced cheque' due to insufficient funds. Defence lawyer Alan Gold asking questions. Did Dennis require a guarantor to get these loans? No. Could he have qualified for more had he asked? Possibly. If he had disclosed his house payment obligation to Richard of $1 ,666 /mth he might have still qualified? Possibly. Do you remember advising him to raise his line of credit? asks Gold. No, says Lefrancois. He got what he applied for? Yes. No guarantors required? No. None of his applications to CIBC ever denied? No. Secured lines of credit on a home can be obtained up to 80% of the home’s value if it has no other loans against it and a borrower has sufficient income. On paper Oland could have borrowed more than $400 ,000 against the house if the bank believed it was free of debt. Was Dennis Oland ever declined for a loan or credit instrument that he applied for? No, says Lefrancois. Despite the borrowings Oland’s financial condition is deteriorating. His accounts are overdrawn in July prior to the murder and he bounces a cheque for interest owed to his father over what he has loaned against the house. Is it right police did not interview you until February 2015, nearly 4 years after the murder? Yes. And you were relying mostly on your memory to give answers - yes. Gold making the point the $88 ,000 increase in March of 2011 started when Oland notified the bank he had an unexpected tax bill of $16 ,000 and wondered if he could expand his credit by $20 ,000 to pay for it. Lefrancois advises him that will result in a $400 fee but if he applied for $30 ,000 there would be no fee. Gold suggests that shows the big increase was partly the bank’s doing but Lefrancois is unsure how things escalated from there to an $88 ,000 increase. Defence lawyer Alan Gold has a few more questions for former CIBC employee Michelle Lefrancois. Shows her a document to refresh her memory. Email exchange between her and Dennis Oland in Feb, 2011. Oland was facing an "unexpected tax bill," says Gold. Next up another CIBC banker David Cosman who dealt with “high value clients”. High value clients he says either have large credit requirements or “significant” investments and get better rates, personal service and a level of forgiveness if cheque’s are bounced for some reason. Cosman dealt with both Dennis and Richard Oland. Cosman is being asked about the $75 ,000 line of credit against Dennis’ house in August 2010 and the $88 ,000 increase in March 2011. Cosman signed the second of the loan documents. Crown prosecutor Derek Weaver is questioning the next witness. David Cosman, who was a financial adviser at CIBC in 2011. Richard Oland was a "high value client," he says. Had a "significant" deposit to the branch, related to shares in Moosehead Breweries, he says. Were you aware Dennis had a loan from his father connected to that house? No. Were you aware of any loan Richard Oland provided to Dennis Oland? Weaver asks Cosman. No. Crown prosecutor Derek Weaver, who handles all financial and technical witnesses, follows up on that point. If Dennis has a $1 ,600/mth obligation would that affect a loan application if it were disclosed? Potentially yes it would affect the evaluation of his ability to repay. If Richard Oland had provided Dennis Oland with an advance on his inheritance, you wouldn't know, would you? defence lawyer Alan Gold asks Cosman. No, he replies. You knew Dennis Oland went through a divorce around 2009? Yes. You knew the house he lived in was the family homestead? asks Gold. Yes, says Cosman. You knew it had been paid off? Yes. You knew Richard Oland was the source of that funding?" I would suspect that, but I would have no way of knowing, nor did I ask." Would be a reasonable inference for you to make? asks Gold. Yes, replies Cosman. No more questions from either lawyers. Cosman is dismissed. Cosman's testimony lasted a bit longer than it did at the 1st trial. When he finished testifying in 2015, Justice John Walsh had remarked: "Last witness, I said, set the record (for being so quick). You just surpassed it!" Oland retrial is on morning recess. Next up is Richard Oland’s accountant Robert McFadden. I’m heading out to file a noon report for radio. Follow @BJMCBC for continuing live coverage. In 1994, Richard Oland owned Brookville Transport Ltd. and hired McFadden away from Baxter Foods. 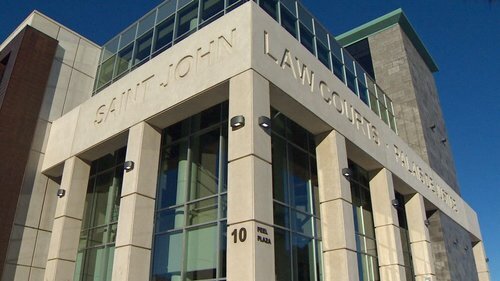 McFadden continued to do some accounting and computer services for Richard Oland until about 2006, when "he essentially took all of my time." Worked with him in his office at 52 Canterbury St. - accounting, IT, helping with charity projects "and I helped him build sailboats"